How to remove a locked gas cap AND make it "keyless"
Alright, this is going to be hit and miss for a lot of people, but I did it, and so can you. If you don't want to bother with all this you can send me your gas cap (locked or unlocked) and I'll convert it to "keyless" for you for a small fee plus shipping, just PM me. Anyway, on to the write up. I'm missing a lot of pictures but it's pretty self explanatory as you attempt it. Here are the tools I made to do this. 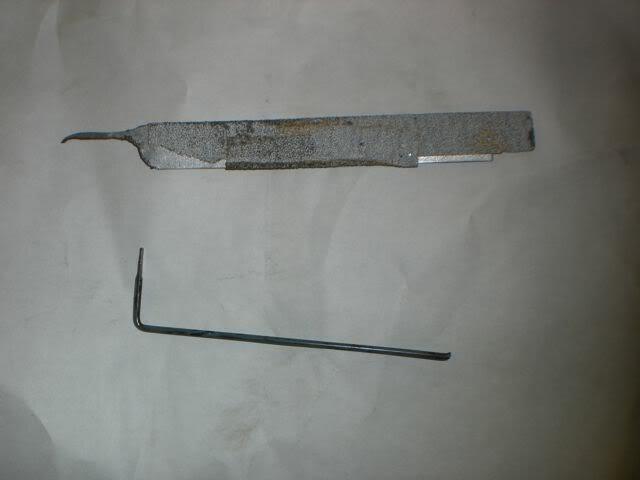 Old hacksaw blades are perfect for lock picks while ground away bent nails are good tension wrenches. Now, easier said then done, but pick that lock! You will spend a lot of time trying to do this, but you will get it. 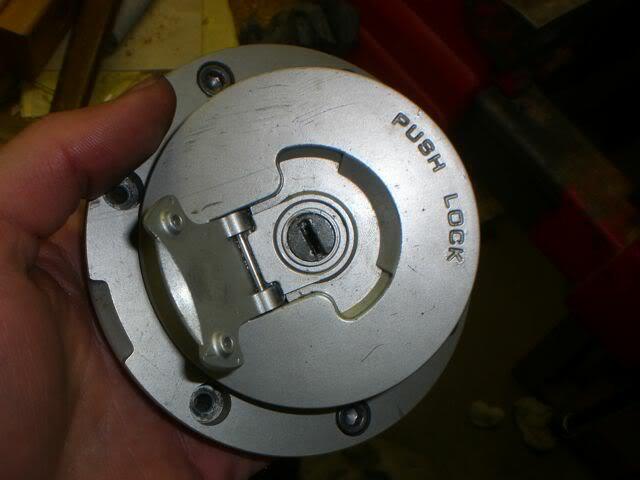 There are 5 pins and the lock cylinder turns CLOCKWISE. There is something about these locks that make them VERY brainless to pick. On most locks, if you push a pin up too far it will still be a "locked" pin. On the gas cap locks once the pin passes a certain point, the rest of it's range of motion will be "UNLOCKED." Read the lock picking tutorial and you will understand what I mean. If you want to make it "keyless," read on! Go to 0:30 of this youtube video to see how to remove the lock assembly from the gas cap. NOTE: In the video you see him push the bottom of the gas cap towards the top of the cap. This causes the cap to lock itself again. SKIP THIS STEP or else you will have to pick the lock a second time. Once the gas cap is out, make sure the key cylinder is in the "UNLOCKED" position. If you grab the cylinder with needle nose pliers, the entire cylinder will slide out. When the cylinder slides out, the pins will fall out rather easily. When the pins are gone, the cylinder locks and unlocks without a key. Put it all back together! Last edited by Taiden; 01-01-2010 at 12:44 AM. 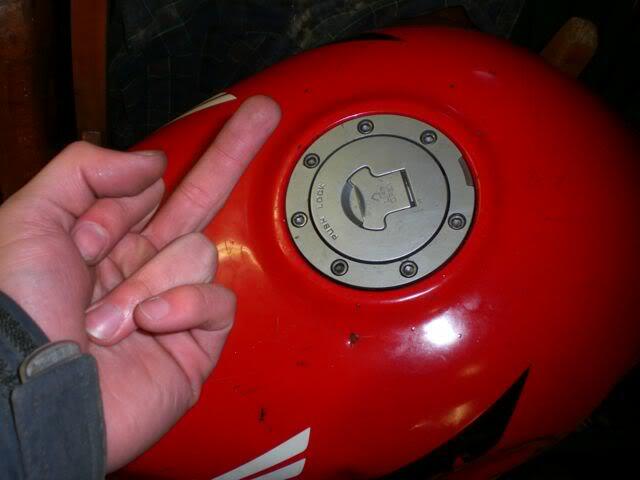 way too many thieves out there not to have a locking gas cap, esp on a bike. Sad but true!!! Excellent info Taiden. Always good to know more about the hidden parts of our rides. I won't be trying this as all have said above.... too many thieves about and if it aint broke no need to mess with it. God write up, no doubt you'll be shifted to the how to's in due course. 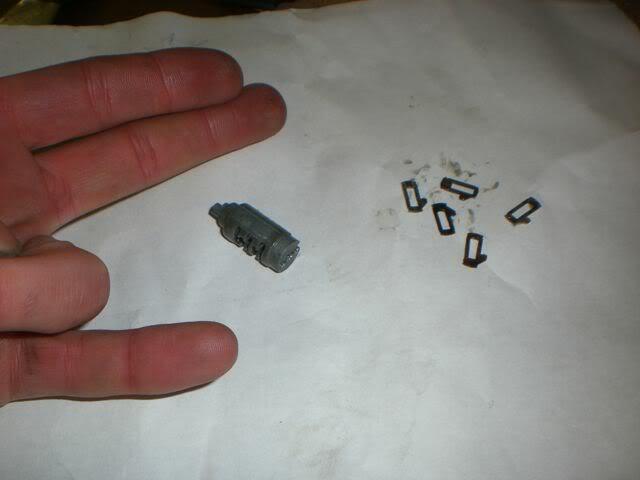 this is more for the people out there who bought a tank on CL or ebay and it didn't come with a key (like me). I couldn't find any info on the matter at all anywhere online other than internet forum hearsay, so I figured I'd give cbrforum a write up. as far as thieves go, these tanks are a joke to lockpick. anyone with half a brain could have your cap unlocked in seconds (assuming your lock is in working order). Last edited by Taiden; 01-01-2010 at 08:29 AM. Okay. I get the possible need to be able to remove a locked gas cap if you lose your key or something, or you buy a gas cap off ebay and it comes with no key, or whatever. What I don't get, is why you would want to have a non-locking gas cap? ...which also begs the question: what keeps the cap closed? If you push down the cap and it clicks, ie now locked, wtf keeps it closed if it doesn't do the *click* which also locks it? If your bike tips on it's side, does the fuel cap now just fling open gushing gas everywhere? 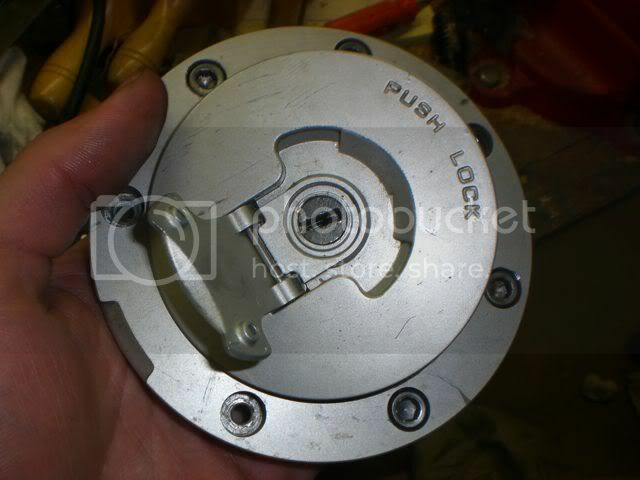 Well by the looks of this right up the locking mech still works the same as it always did, just works without the key now so while pressing down you could turn it with your fingers. But even yet, I don't like the idea of it. What would you turn with your fingers? 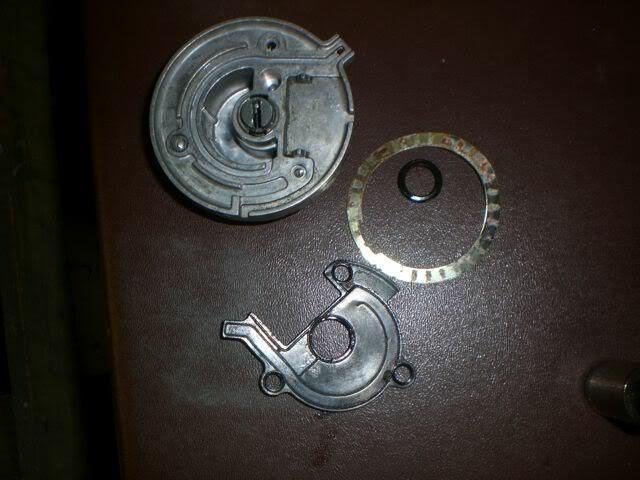 It's the key that is used to rotate the locking mechanism, which is also has the resistance of the internal spring, which makes the latch keep the cap from opening. I can't see A: the ability to overcome the resistance of the spring keeping the latch closed, with just your finger tip trying to push down and turn the place where the key used to go in, and B: what on earth would make that less of a hassle than just using your key in the first place? Don't get me wrong, I'm not dissing this mod at all, I'm just too dumb to understand what's really going on here, and need it explained to me so I can see the point of it. 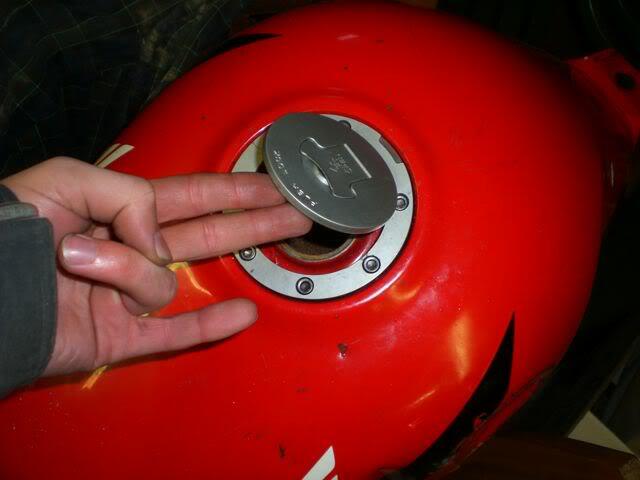 Quick Reply: How to remove a locked gas cap AND make it "keyless"